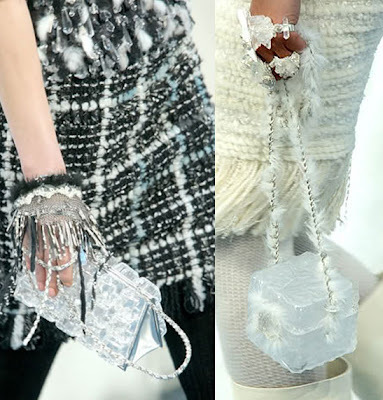 Maybe Karl Lagerfeld had looked into his Swarovski crystal ball and predicted this coming winter is gonna be extremely cold! So he offers up a fabulous collection that features this mystical Eskimo chic girl who lives in the igloo castle located at an extremely cold fantasyland that only the polar bear style coats can keep her warm! 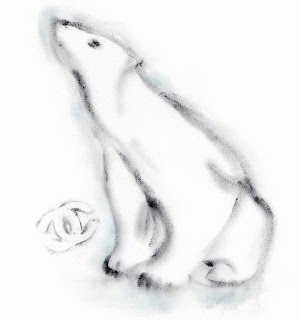 Better yet, how Coco Chanel would travel to north pole and how she would dressed! 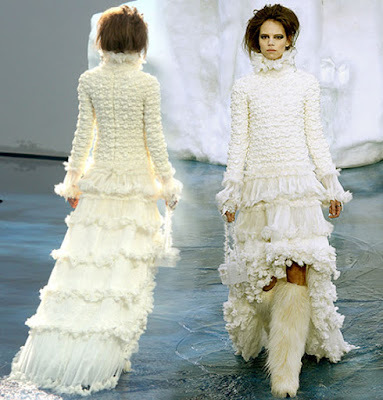 Karl Lagerfeld had never fail to surprise us season after season with his vision! At the Grand Palais Paris this week, guests arrived with an invitation that has a polar bear sketched on it and once they walked in, there was a huge white box, which sat in the middle of the stage. 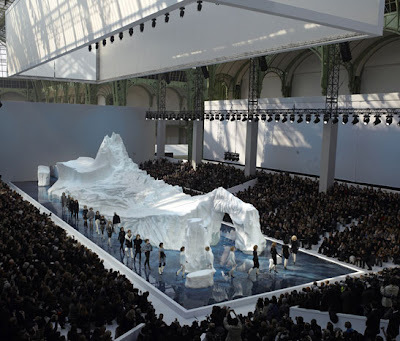 As the show began, the box was lifted to reveal a huge 256 tons of iceberg imported from northern Sweden. The collection featured every luxurious materials you can think of that’s almost like a Couture show than the ready to wear! 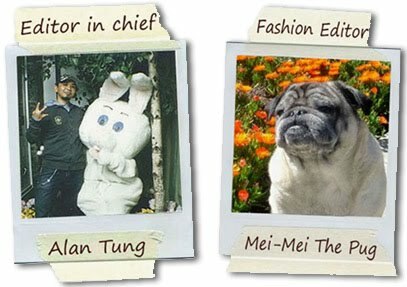 Fur was woven into tweed fabrics for jackets, coats, skirts, also was weaved into luscious cashmere, angora sweaters & dresses. Thank God it was faux fur! 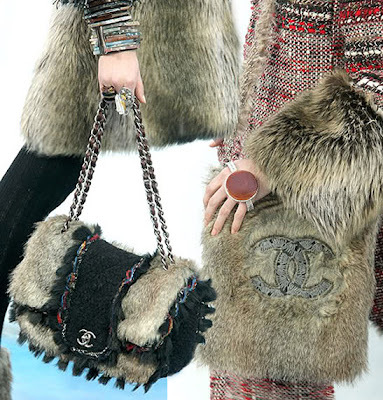 I would hate to see some cute little furry animals died just for our vanity, even if it’s for the fabulous CHANEL dresses! 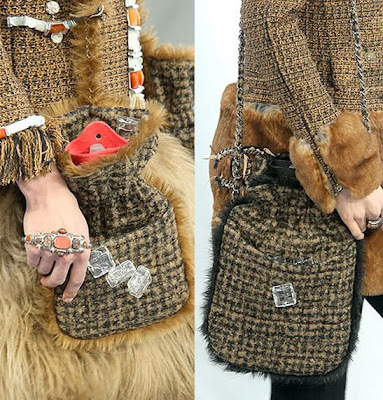 How about the accessories & handbags in the show you might ask? All I can say, it is so “COOL” that I want almost everything! Yes there is even a bag to hold a hot water bottle; you know the red plastic thing filled with hot water to keep you warm?! 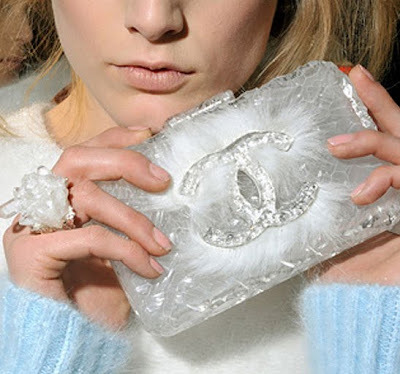 Talk about keeping it warm in Luxe style! Haha. I especially love the “Ice Cube” themed bags! 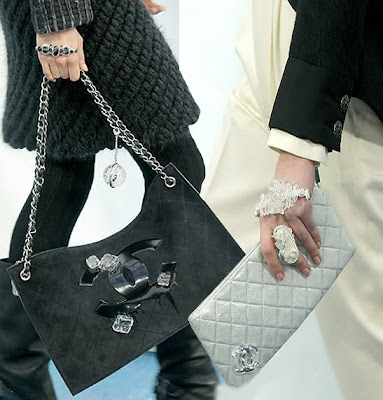 Cute & clear ice cube decorated the bags with CC logos and there are couple evening clutch that looks like a chunk of ice cube and pave with Swarovski crystals CC logo! 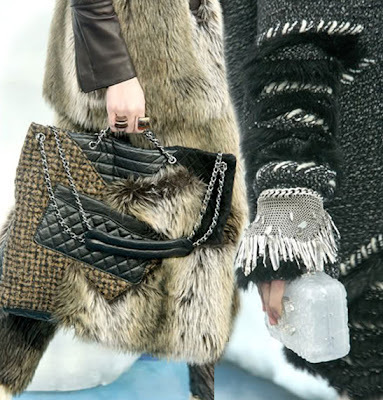 Here are some photos of these fabulous bags that is a must-have for this winter! Click the video player below to view this fabulously “Cool” show! I am calling my personal shopper at Bergdorf Goodman & Chanel Boutiqes to get me on the wait-list for some of these fabulous items!! 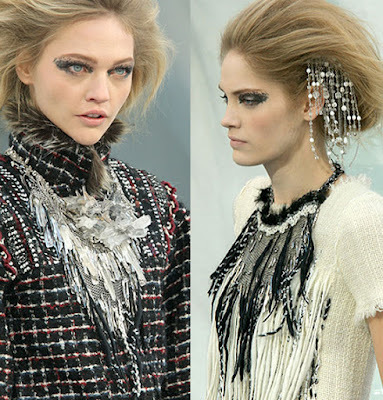 To find out more about this collection, please click here to visit CHANEL official website.